Galactus actually licking his lips as he prepares to devour the Earth; Johnny's "Flame On Rap" and not one but THREE episodes ending with a "cute comedy fluffy dog" coda. Then there's Behold The Negative Zone, during which the Thing interfaces with said place after ordering a smiling elephant for Alicia on the Home Shopping Channel. Yes, really. 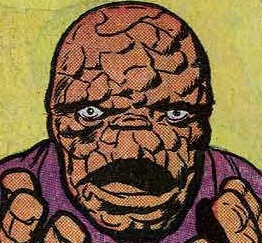 Having said all this, I must ashamedly confess to actually laughing at the inanity of the Thing's "Clobberin' Time Rap" with Green Jelly.Based upon the early Lee/Kirby comic strips, the first season took only loose inspiration and contained the following episodes: The Origin of the Fantastic Four: Parts 1-2; Now Comes the Sub-Mariner; Incursion of the Skrulls; The Silver Surfer & the Coming of Galactus: Parts 1-2; Superskrull; The Mask of Doom: Parts 1-3; Mole Man; Behold the Negative Zone and The Silver Surfer & the Return of Galactus. While it didseem to improve towards the end of the run, generally the experience felt like watching something truly quite wretched.